Anyone who knows me knows I love a good face mask. (Just click here for proof.) 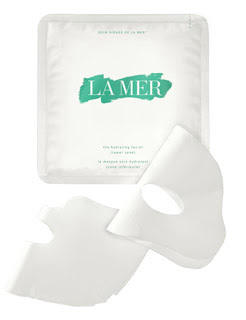 Well, La Mer has most definitely upped the ante with the brand-new The Hydrating Facial. Similar to my previous fave from SK-II, the nourishing treatment comes packed into an actual mask that you slip over your face. But in an interesting twist, each package has two masks -- one for your upper face and one for your lower. I actually love this, because it proves quite hard to try and maneuver a mask covered in product onto the entire face. Having it split into two sections made it much easier to cover each and every part of my parched, dried-out, calling for immediate moisture relief visage. And the best part? In only eight minutes, my skin was totally and completely refreshed. Thanks to ingredients like The Sea Moist Ferment (a blend of dark green algae from all over the world to infuse the skin with intense hydration), a combination of cellular lipids, plant extracts and marine plant algae (to fade dark spots and discoloration and create a smoother surface), and a duo of tourmaline and Mariponic Ferments (to boost hydration and set molecules in motion), my skin looked absolutely amazing. And it stayed that way for days! La Mer The Hydrating Facial is $250 for 6 applications at cremedelamer.com. Hey was wondering if you know anywhere i could get this product for a better price?